i made this one morning when i needed an extra satisfying breakfast to make it through my morning. i added the protein nice cream as an afterthought to balance out the meal. feel free to switch out the chocolate protein nice cream for another flavor by using a different flavored protein powder. Spread the peanut butter on the slices of bread then layer one of the slices of bread with pieces of banana. be sure to save a couple extra pieces of banana for layering after the sandwich is done cooking. slice one strawberry into 3-4 pieces and layer between the banana pieces. 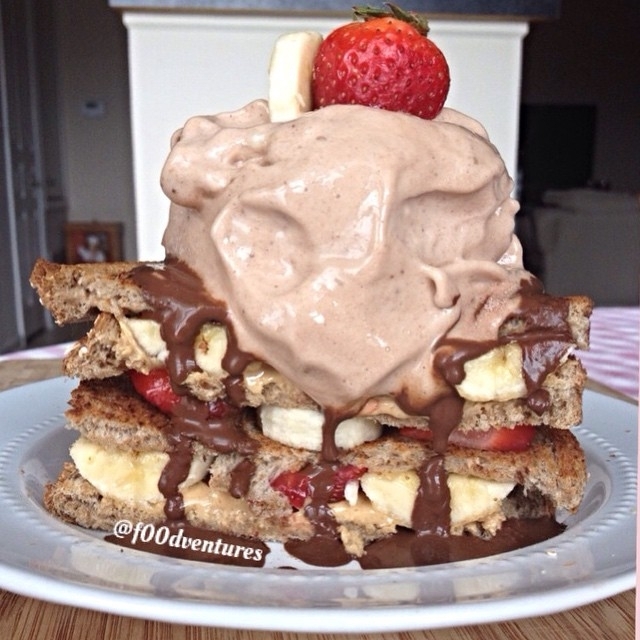 place the other slice of bread on top of the piece with the banana and strawberries. place in a skillet and cook a few minutes on each side utnil bread is browned. remove from heat and cut in half. layer the rest of the banana and strawberries between the sandwich halves. drizzle with chocolate sauce (if using) then set aside to prepare the nice cream. blend one frozen banana with a scoop of protein powder until smooth and creamy in consistency. scoop on top of sandwich and enjoy.